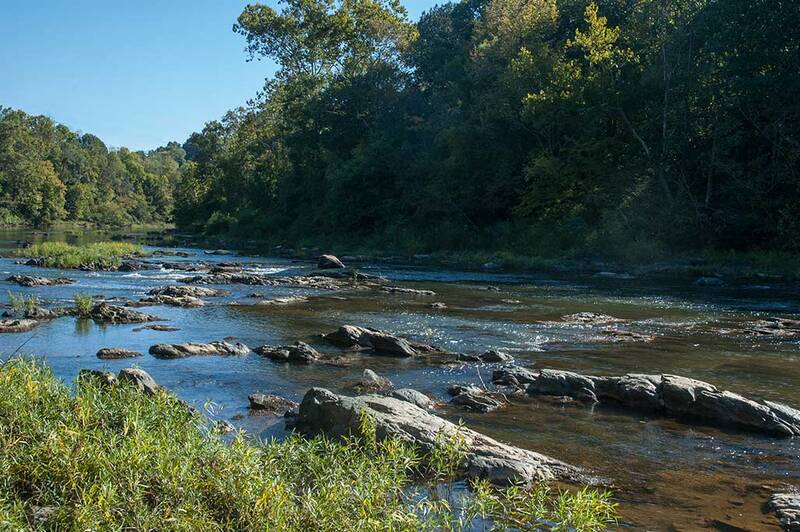 Historically, the Rivanna River played an essential role in the settlement, use, and development of the Charlottesville region. For Monacans and other native people, the river provided food, an important means of transportation, and a secular and spiritual landscape in which the riverbanks accommodated villages for the living and burial mounds for the dead. As Europeans and Africans and their descendants moved into the region in the early eighteenth century, the Rivanna River’s primacy continued. Settlers relocating from eastern Virginia traveled along the river system, up the James River to the Rivanna River; there they followed the Rivanna northwest through the passage in the Southwest Mountains into the Charlottesville region. In the 1730s, Peter Jefferson, William Randolph, Nicholas Meriwether, and others settled huge royal land patents, tracts that often took the Rivanna River as their border. The river and the lands along it were the most familiar, civilized, settled, and cultivated part of the region. The river’s name itself involved a gesture of culture and appropriation, honoring Queen Anne who reigned over England, Scotland, and Ireland from 1702-1714. This entry was posted in Rivanna River by WmX. Bookmark the permalink.